No two construction projects are the same, which also applies to the dewatering systems. Two new pumps by pump manufacturer Tsurumi offer greater scope to come up with ideal solutions. They will be presented for the first time at the Bauma 2019 in Munich, Germany, from 8th – 14th April. With its innovations KTZ415 and KTZ615, the Japanese company has outdone its series of professional drainage pumps for difficult applications. The 615 is the new top model of the KTZ series that now comprises 15 models. 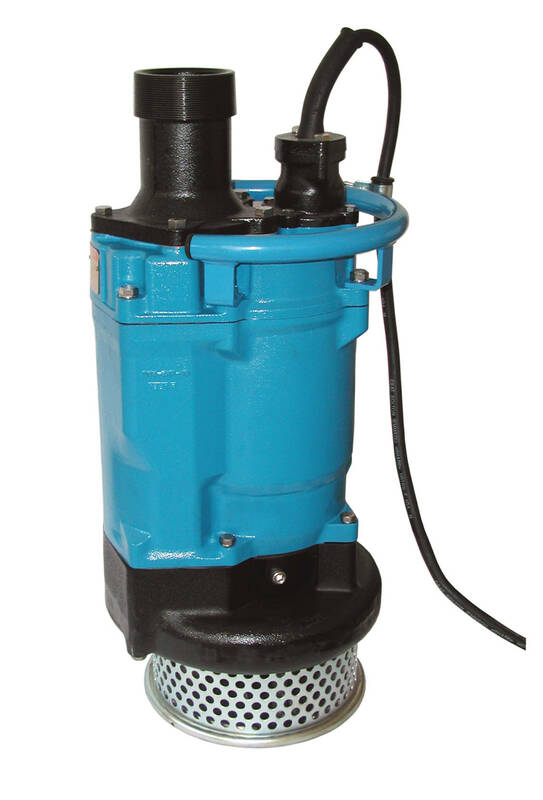 Thanks to a motor output of 15 kW, the aggregate achieves up to 2800 l/min with discharge heads of almost 40 metres. In contrast, the 415 with the same motor ‘only’ pumps 2000 litres but up to a maximum height of 55 metres. “We are launching this high-performance duo that complements itself;” says product manager Stefan Himmelsbach. Both submersible pumps can cope with sandy water, groundwater and rainwater. The water may also contain stones with grain diameters of up to 12 mm. The pumps are pressure-resistant to a submersion depth of 25 m and have a pressure port with a diameter of four (model 415) and/or six (mode 65) inches on the outside thread. The KTZ series was launched back in the 1980s and is one of the best-selling pumps in the product line. Even the smallest model with a motor output of just 1.5 kW can move 430 l/min up to a height of 21.5 m. Obviously the manufacturer can deliver precisely what the target group requires with the KTZ. The highlights of the series also include the dry running-safe design (motor cooling and oil lubrication), the high wear-resistance (abrasive pumping media) and the fail-safe feature (electrics). The KTZ is built in Tsurumi’s mega factory in Kyoto that is the world’s largest production site of its kind. This manufacturer supplies a total of 44 series for direct sale via 250 dealers in Germany alone. Many pumps can be leased. Tsurumi will be displaying many other pump models for structural and civil engineering projects in Hall A6 at Stand 338, as well as another innovative that it still under wraps but which will be launched in 2019. Engineering enthusiasts can also look forward to exhibits of cutaway pump models and live wet applications. Tsurumi’s European central office in Düsseldorf will also be celebrating its 35th anniversary during this time: this will also be addressed.